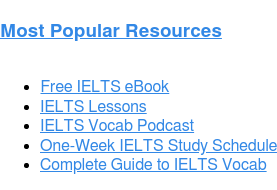 This Guide to IELTS Reading begins by covering some basic IELTS Reading information so you can become familiar with the test. However, this post mostly focuses on IELTS Reading practice tests, strategies, and tips to help you perform better. 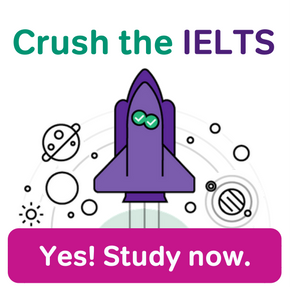 Whether you started preparing for the IELTS only recently, or you’re familiar with the exam already, this guide will give you the information and strategies you need to push your score even higher. If you’re struggling to get the results you want on the IELTS Reading paper, you’re definitely not the only one. Many people find IELTS Reading to be very tough. The vocabulary alone is difficult, not to mention the wide variety of question types IELTS uses to measure your skills. Try not to get discouraged. Instead, get to work! 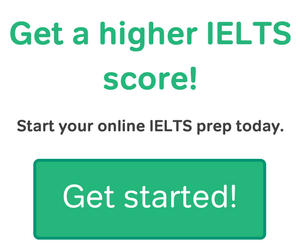 Smart and consistent preparation can really pay off on IELTS Reading. Click the links below to go to each section of our IELTS Reading Guide. There are two versions of the IELTS exam: Academic and General Training. If you don’t know already which version you need to take, check with the institution(s) to which you plan to apply. The Reading and Writing sections (but not Speaking and Listening) are quite different between the two formats. You don’t want to prepare for the wrong one! The Academic and General Training Reading papers do share some features. For example, both take 60 minutes and contain 40 questions. Also, even though the Reading passages are quite different between the two exams, the strategy for answering questions is actually very similar. This is because the question types are generally the same on both versions. However, the Academic and General Training Reading exams differ in some important ways. Let’s take a look at their unique features, along with some official IELTS questions for both versions of the test, so you can get a sense of what to expect. Academic IELTS Reading passages cover a wide range of subjects, such as science, history, the environment, etc. You do not need to be an expert in any of these fields. However, test-takers with a large vocabulary have a huge advantage. Academic IELTS Reading passages may contain some technical terms and even visual materials such as charts and graphs. IELTS commonly uses passages from professional and academic journals, textbooks, reports, and newspapers. The Academic Reading paper consists of three passages. For each one, you will answer 10-14 questions. Here are some sample Reading passages and questions from the British Council (the makers of the IELTS exam) so you can see what Academic Reading passages and questions look like. Try to answer the questions and see how you do! Like Academic Reading, General Training Reading also includes articles from journals, newspapers and magazines. However, the majority of the passages are much shorter, with simpler vocabulary. Additionally, the topics tend to relate to daily life. Some passages, especially towards the beginning of the General Training Reading paper, are taken from advertisements, guidebooks, magazines, notices, or employee manuals. While each version of General Training IELTS Reading can be slightly different, you can generally expect that the exam will get more and more challenging from beginning to end. In Section 1, there will be 2 to 3 very short (and relatively simple) articles related to everyday life topics. In Section 2, there will be two short texts. These are often related to work in some way, such as a job application or company handbook. Finally, Section 3 will contain a longer text discussing a more academic or abstract topic. This is the toughest article on the General Training Reading exam. For more information about the types of topics you might see, check out our blog post on General Training Reading passages. For practice, here are some reading sample tests from British Council for the General Training IELTS exam. Try to answer the questions and see how you do: Section 1, Section 2 and Section 3. Apart from taking practice tests, you should be reading English regularly as you prepare for the IELTS. Definitely don’t limit yourself to IELTS practice materials. Reading English newspapers and magazines is an excellent way to develop your comprehension. In fact, many IELTS reading passages are selected from these sources. Here is a list of resources you can use to develop your English reading abilities. These materials are all very appropriate for IELTS reading samples. Pacing is critical in order to do well on the IELTS Reading paper. This is especially true for the Academic IELTS, but it also applies to the General Training Reading exam. Sixty minutes is not a lot of time get through all of the passages and answer 40 questions. Since each question is worth the same amount of points (1), it makes most sense to divide the 3 sections equally—spending 20 minutes per section. Instead of reading each passage carefully, it works much better for most people to “skim” the Reading passages. This is something we will discuss in detail in the “Strategy” section of this post below. I advise my students to spend 3 to 5 minutes quickly skimming the passage before looking at the questions. That leaves 15 to 17 minutes to study the questions and find answers in the text. Note: Unlike the Listening exam, you do not have an extra 10 minutes to transfer answers from your Test Booklet to your Answer Sheet. On the Reading paper, you need to record all of your final answers on the Answer Sheet within 60 minutes. Scoring is fairly simple on the Reading section. Each question is worth 1 point, so you can achieve a “raw” score of up to 40 points. From there, IELTS converts your “raw” score into your Band score. You can find a basic band score conversion table on the official IELTS website. However, keep in mind that each version of the IELTS is slightly different. The tables can give you a general idea about how “raw” Reading scores are converted to band scores. It is also important to keep in mind that the hardest questions and the easiest questions count equally towards your final Reading score. Therefore, if you’re struggling to finish all of the questions within 60 minutes, make sure you’re not losing out on easier points because you get stuck on hard questions. Sometimes, you simply won’t understand a question or a segment within a passage fully. Other times, no matter how hard you try, you won’t find an answer in the text. If this happens, just make your best guess and move on so you don’t miss out on easier points later in the test! You can always return to a difficult question later if you have spare time at the end. The more vocabulary you know, the easier the IELTS Reading exam will be for you. Vocabulary is very, very important if you’re aiming for a high Band score. As you prepare for the exam, make sure to study new words regularly. Your goal should be to learn 15 to 20 new words each day. Also, try to read in English regularly (15 to 20 minutes per day at least!). It’s an excellent idea to keep a vocabulary journal as you read. Record new and unfamiliar words, and then define each one with a synonym or short definition. Keep it simple. You should return to your list a few times each week to review, focusing attention on terms you have difficulty remembering. 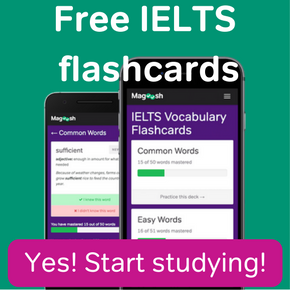 Additionally, Magoosh offers a Vocabulary Flashcard app and a Vocabulary PDF word list for the IELTS. (Bonus: They’re both free!) No matter how you prefer to review vocabulary, study a little bit every day! Each set of questions will have its own instructions telling you how to mark your answers. As you practice, get into the habit of looking at these instructions every time. You don’t want to miss points because you didn’t notice a key detail in the directions. The IELTS Reading exam is probably different than the English reading tests you’ve taken in school. Most of the time, reading exams involve carefully reading a passage from beginning to end, and then answering comprehension questions about it. In theory, this is also what you should do on the IELTS Reading paper. Strategy 1: Skim each passage for 3 to 5 minutes before looking at the questions. Learning to skim a passage effectively can save you a lot of time. To skim, simply look over each paragraph quickly, but in a strategic way. You should read the first line or two of each paragraph normally, but then you should go over the rest much faster. As you skim, you’re trying to notice words that stand out because they seem important. This helps you to get the “gist,” or the basic sense of each paragraph. The ultimate goal of skimming is to notice things in the text that will help you answer questions. You may find people’s names, or important dates. You may also figure out how a passage is organized. For example, imagine you are reading a historical text. Often, historical passages are organized chronologically, from the beginning of a time period to the end. Skimming effectively will help you to notice this organizational pattern, and this knowledge will most likely help you to find answers to questions more quickly. Any time you get a question that includes a date or time reference, you’ll know where to look because you’ve skimmed the passage effectively. Notice the title of the passage. It often gives you a general idea about the main idea of the text. Read the first sentence or two of each paragraph. Often, this is where the main idea of each paragraph is located. Underline words that stand out to you as important. This will help you get a general idea of what is being talked about. Pick out words that have something in common (i.e., airports, passengers, lounge, fly). Ignore words that you do not know. Focusing on words that are unfamiliar to you will slow you down. At all times, try not to get caught up in the detail when you skim! Below is an extract from an IELTS Reading passage. Some of the words are in bold after applying the techniques above. This can help you see how the key information jumps off the page when you incorporate skimming. Now try it yourself! Just read the bold parts and ignore everything else. Can you tell what the passage is mainly about? Could you take a guess at the main idea of each paragraph? Strategies 2 and 3: As you skim, underline keywords in the text and write short notes as reminders in the text. As you skim, quickly underline each word that seems important in your Question Booklet (which contains your Reading passage). In other words, don’t just skim with your eyes. Use your pencil to underline things that stand out as you skim the passage. Secondly, as you skim, quickly write very short notes (2-5 words) next to each paragraph with your best guess about the main idea of that paragraph. You don’t have to be comprehensive or even 100% right about your “guess” in order for it to be useful. To be sure, if you had time to read the paragraph carefully, you could almost certainly come up with very good and accurate summary notes. But you might be surprised how close you can come to the main idea of each paragraph just from skimming. Just by focusing on the words in bold, could you write a few notes next to both paragraphs with your best guess about each one’s main idea? Try it, and then look at the examples provided immediately below. These simple notes can be incredibly valuable. Many questions ask you to find the main idea of a paragraph, like you must do for “Matching Headings” questions (which we’ll look at closely later in this post). Your underlined words and notes can even help you with detail questions by providing clues about where to search for answers in the text. After you’ve thoroughly skimmed the text, you’re ready to turn to the questions. Each question type is slightly different, so you’ll have to vary your approach in some ways for each new set of questions. However, the strategy discussed in this section applies to them all. The basic concept is simple: First, read the questions carefully and look for keywords. Then, you scan the passage for answers. When you look for keywords in the questions, you should underline the most important ones. This may sound like a lot of extra work, but it really shouldn’t require a lot of time. As you read, simply use your pencil to mark up the questions. These keywords provide the concepts for which you’ll need to search in the passage. As you’re probably aware, IELTS questions almost never use the same language as the actual reading passage (except for incorrect answer choices!). 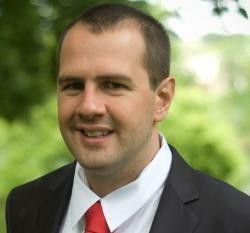 Instead, the questions will be paraphrases of information found in the article. This is one way the IELTS tests your vocabulary. Paraphrases will be synonyms or different forms of words found in the text. A paraphrase could also be an entire sentence that conveys the same meaning as a sentence in the passage, while using different words and sentence structures. When you underline keywords in the questions, you’re identifying the IDEAS you need to search for in the passage. Use a strategic approach when you scan the reading passage for answers. It’s best to begin with questions that have keywords you think you can find easily in the text. When you answer questions that are “easy” to locate, you will learn a little more about what is contained in the Reading passage because you had to read some segments closely to confirm your answers. This process continues with each question you answer. It is possible (and fairly common!) to find an answer to a different question than the one you’re searching for at that moment. What makes one question easier to scan for in the text than another? Perhaps a question stands out to you because you remember seeing the topic in the text when you skimmed, underlined, and took notes at the very beginning. But there are some other things that can make an answer easier to find by scanning. For example, numbers and proper nouns like names or locations often stand out visually in a text. A date like 1950, and the names Jane Smith and New York City would be very easy to locate among other words. Once you find the words you’re looking for, read the surrounding sentences carefully to find the answer to your question. There are several types of questions you may encounter on the IELTS Reading paper. The descriptions and tips below will help you understand each one. Make sure to study the official practice questions as well! Wherever possible, both Academic IELTS and General Training IELTS examples are included. This is a traditional question type with which you are probably very familiar. You will be asked to select the correct answer to a question from a set of choices. IELTS Reading Multiple Choice questions can test a variety of things. Some will focus on details, while others focus on main ideas. As with other question types, you should look for keywords in the questions and the answer choices before you scan the passage for answers. True/False/Not Given questions can be very tricky. These questions consist of several statements. You need to decide whether each one is TRUE according to the passage. This means that the information in the question statement agrees with information in the text. However, if the question statement contradicts something found in the passage, you must mark the answer FALSE. A third option is also possible. 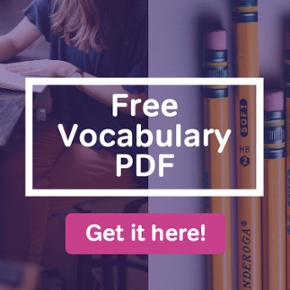 If the information in the question statement cannot be found in the article (the article does not say whether the statement is true or false), you must mark NOT GIVEN. This is tough! It is very easy to waste a lot of time searching for something that is, in fact, not there. Try your best not to spend excessive time on these questions. If you can’t find an answer after you’ve searched for it thoroughly in the article, mark NOT GIVEN and move on. You don’t want to lose easier points because you spent too much time looking for an answer that might not be there at all. For more tips on tackling this question type, check out our article on how to answer True/False/Not Given questions. Yes/No/Not Given questions are almost exactly the same as True/False/Not Given questions. The difference is that they focus on ideas, not facts. Yes/No/Not Given questions are common for reading passages that present an author’s opinions or perspectives. Your job will be to say whether the statements in the questions agree (YES) or disagree (NO) with what the author states in the essay. If the information isn’t discussed directly, you must answer NOT GIVEN. There are a few types of Matching questions on the IELTS Reading paper. Each one has its own unique features. This type of question asks you to match a list of “headings” to each paragraph in the passage. A correct heading captures the main idea of one paragraph in the text. Usually, there are some extra headings in your list which do not work with any of the paragraphs. These extra headings typically do not represent the text accurately, or (commonly!) they represent a minor idea found within one of the paragraphs. To get a headings question correct, you must find the heading that articulates the main idea of a paragraph. Sometimes, you can find the main idea in the first sentence or two. This is definitely a good place to look first. But don’t stop reading after the first two sentences as you try to answer these questions. Scan the remainder of each paragraph to confirm that the heading represents everything contained in the paragraph in a general way. Our article on tackling Matching Headings questions offers some additional information on these question types. This type of question asks you to match information from a list with one of the paragraphs in the passage. Matching Information questions can be very tricky because you need to search for details. To answer them correctly, you need to find the paragraph that contains the information presented in the question. As always, this information will be paraphrased, so don’t look for the exact wording in the text. Search for the same idea. This type of matching question presents you with a list of items in a box. These items will be categorized in some way. For example, they may be the names of people or cities. Of course, each item will be mentioned in the reading passage as well. Your job is to match phrases or sentences in the questions with the appropriate items listed in the box. 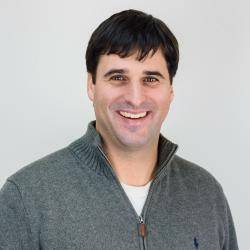 If the box includes a list of people mentioned in the article, then the questions may ask you to match statements with the person who said them. Frequently, some choices in the box will not relate to any of the questions, and some choices will be used more than once. The directions will always tell you whether you may use an answer choice more than one time. Try to scan the passage for answers to each question, rather than using the items in the box to direct your scanning. This is because some answer choices in the box may not relate to any of the questions, you might waste a lot of time scanning for information that doesn’t answer any of your questions. agree with the information in the reading passage. Sometimes, you can easily determine that a few answer choices won’t work with some of the questions because they create ungrammatical or illogical sentences when combined. However, this only works to eliminate a few combinations. To get the correct answer, you will have to search for information in the text to confirm that your combined sentence agrees with the passage. An important feature of these questions is that the answers will come in order in the passage. In other words, if you find an answer to question 3 first, you will know that the answers to questions 1 and 2 will be found somewhere before the information for question 3 in the passage. This can be incredibly helpful if you’re confident you’ve found correct answers to a few questions! It can help you locate more difficult answers. Sentence Completion questions and Short Answer questions are very similar. Sentence Completion questions ask you to fill in a blank at the end of a sentence with some words taken from the text. Short Answer questions also require you to choose some words from the text for your answer, but the words you need to fill in aren’t located at the end of a sentence. Typically, you simply need to answer a question about the text for regular Short Answer questions. It is very important to read the directions carefully each time. The directions will state a word limit. For example, they will say you should write “NO MORE THAN THREE WORDS and/or a NUMBER” for your answer. Some questions limit you to ONE or TWO words. If you exceed the limit, you will miss the question, so pay close attention to word limits. On these questions, the answers will come in order in the passage. When you find a correct answer, you’ll know that the answer to the next question will come later in the text. This type of question asks you to complete a set of notes, a table, a diagram, or a summary with information from the text. Sometimes, this will be a Short Answer question. Other times, you will choose from a set of answers in a box or from a list. Very often, the answers to these questions can be found in one portion of the reading passage, so it is very likely you won’t have to scan the entire text to fill in the necessary information. Diagram label completion questions are usually associated with hard sciences, especially biology. On the exam, you’ll often label the body parts of an animal, a diagram of an ecosystem, or other biology-related infographics. Studying for the IELTS Reading paper is just one part of a good study plan. Make sure you have all the resources you need to achieve your target band score! Magoosh offers IELTS Prep lessons to help you learn exam strategies in depth. Many students who need guidance with IELTS Reading also need some assistance with IELTS Writing. 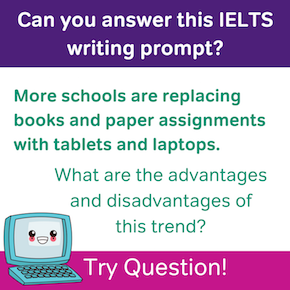 Luckily, these guides to IELTS Writing Task 1 and IELTS Writing Task 2 are here to help you prepare for this difficult portion of the exam. Finally, depending on how much time you have before exam day, this one-month IELTS study schedule can help you stay organized. If your time is more limited, get to work with a one-week IELTS study schedule! Great question! Although there are no officially published rules about the appearance of different answer types in IELTS Reading, you should expect that there will always be at least one True, and least one False, and at least one Not Given in any TFNG answer set. Similarly, YNNG (Yes, No, Not Given) question sets will include one of each answer. This is the case in all official practice materials from Cambridge, the British Council, and the official IELTS websites.